Team TWiV cover the discovery of another giant virus from 30,000 year old Siberian permafrost, and how viral aggregation accelerates the production of new infectious viruses and increases fitness, demonstrating an Allee effect. From the TWiV team, human cowpox infection possibly acquired from a pet cat, and a new giant mimivirus of green algae with genes encoding enzymes of fermentation. 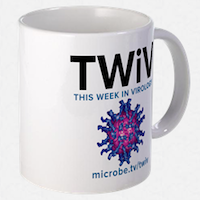 In the first episode for 2018, the TWiV team reviews the amazing virology stories of 2017. The TWiVsters reveal new giant viruses that argue against a fourth domain of life, and discovery of viruses in the oceanic basement. The TWiVrific gang reveal how integration of a virophage into the nuclear genome of a marine protozoan enhances host survival after infection with a giant virus. The esteemed doctors of TWiV review a new giant virus recovered from the Siberian permafrost, why influenza virus gain of function experiments are valuable, and feline immunodeficiency virus.